Ignacio Gil's tweet - "Ave Maria "
Eu to sem palavras com esse vídeo, vocês entendem a sensibilidade que tem isso? Oh my God, this is utterly heartbreaking. This will give you the chills. 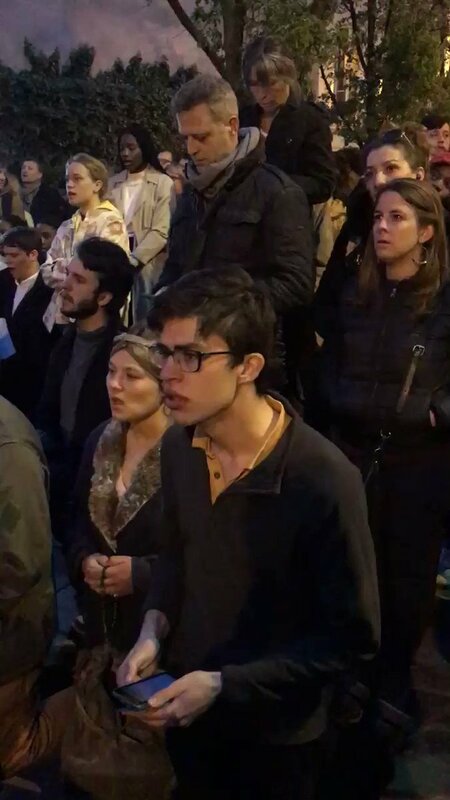 French men & women sing as they watch Notre Dame burning. Gives you hope. Singing to a dying building. Devastating tribute to Notre Dame, the spirit of Paris, and France. Hier krijgt een mens toch de rillingen van? Het gezang, die jongens op hun knieën, de camera die langzaam draait en dan de brandende Notre-Dame de Paris. Incredibly moving. Parisians sing hymns as Notre Dame burns. This is giving me chills. I can feel their pain but hear their love . Ave Maria sung in French is so beautiful. I'm sobbing as I listen to this & watch Notre Dame burn. Heartbreaking to see Notre Dame on fire. Parisians come together to sing hymns in response. This is ... words fall short...Indescribably moving. In tears. İnsanların bağ kurma ve onu yansıtma biçimleri beni çok duygulandırıyo. Neye bağlandıkları önemli değil ama böyle bi şekilde sevgi göstermesi, yok olurken ona veda etmesi fln.. Bilemiyorum duygusal ılıklık zor baya. Paris. You are truly something. Beautiful in so many ways. This is surreal to see and hear the beautiful singing on the backdrop of such a historically devistating fire. MEMENTO MORI - nawracajcie się póki czas. pelos de punta al ver a los franceses cantarle a Notre Dame. If good is to come from this (and we must believe that God works all things to the good of those who love Him), it begins here. Not with the rebuilding of a temple made of wood and stone, but with the rebuilding of the temple not made by human hands in the hearts of the faithful. This is the right response. Our Lady, come to our aid! This strong display of humble faith gave us chills. The good news is the cross and altar were saved at Notre Dame in Paris. Impresionante el vídeo de Ignacio. Capta el hecho, la emoción e incluso el sentido histórico del momento, el peso de los siglos y la fragilidad de la vida. The singing is beautiful, and seeing people gather together is wonderful...sad that it's because a piece of art and history burns. God does not live in structures, no matter how glorious; God lives in Spirits. No fire can destroy that Beauty. A symbol of resilence, a sanctuary, the heart of a nation that will continue to stand the test of time. Still, a tragedy. I wasn’t going to share any images of the disturbing horrific fire but I’ve decided to make an exception for this. I burst into tears😢 Loves from turkey..
A song outside a sanctuary. What a sad day for so many people in Paris. One of the most beautiful and poignant moments of this day, a sad and tragic one but also a beautiful one for our Faith. May France rise again from the ashes stronger in grace and love of the Lord. گاهی نمی‌شود جلوی حادثه‌ای رو گرفت، چه پلاسکو چه #نوتردام ، چه سیل ایران چه آمریکا، و همین گاهی‌ها مردم هیچ سلاحی برای آرامش پیدا کردن و حس مفید بودند ندارند جز نوحه سرایی و دعا کردن! مسائله اما اختلال شعور و فهم ما در برخورد با پدیده‌های اینچنینی مخصوصا از نوع وطنی‌ست. Moving for many reasons, but the youthfulness of the Parisians on their knees singing is striking. La piel de gallina. Me uno a la oración de nuestros vecinos franceses. Mal her yerde mal, hadi tanrı yangını söndürecek diye dua ediyosun, be amına koduum o yangın en başta neden çıktı? Människor samlas utför Notre Dame och sjunger. Sevdiceğinin ölümünü izler gibi, çok ama çok acı... Bazı acıların tarifi yok ama müzik iyi ki var. "Ave Maria" ile Notre Dame Katedrali'ne ağıt yakan Parisliler. Ik ben al heeeel erg lang geen katholiek meer, maar ik krijg hier heel erg kippenvel van. Nous sommes avec vous, Paris. Fransen zingen Ave Maria naast de brandende #notredame Indrukwekkend. This #AveMaria: quiet, calm, resilient in the face of so much going wrong. Ok, now I’m crying for real. So sad and yet so beautiful. Es un poco odioso que se junten dos docenas de franceses aleatorios en la calle y suenen así de bien rezando el Ave María, la verdad. The singing, the grieving, the gathering to do SOMETHING when there's nothing they can do...is beautiful. Our need to be together in sorrow makes us human. This is faith.